Pinedale Online > News > February 2010 > Pinedale Roundup stories – Feb. 12, 2010 > The Final Test? 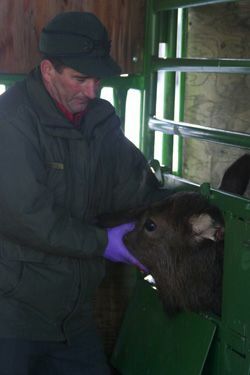 WGFD Wildlife Biologist Dan Thiele holds an elk being tested during this year’s first weekend of testing at Muddy Creek. The final testing session of the pilot program was conducted last weekend. Photo by Kaitlyn McAvoy, Pinedale Roundup.